Wells Fargo's scandals took their toll in 2017. What should investors expect over the next year? 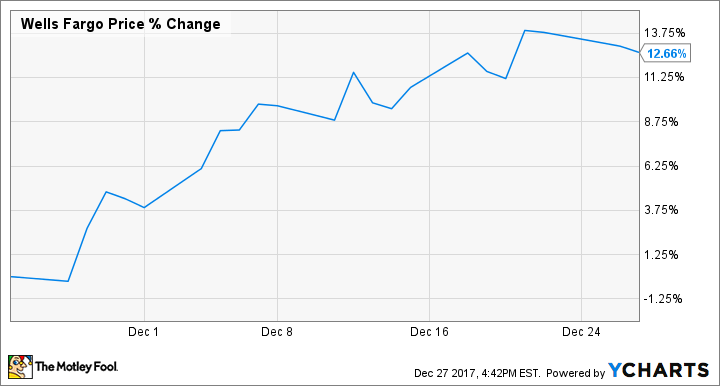 Wells Fargo (NYSE:WFC) did not have an excellent year in 2017. The bank's infamous fake-accounts scandal turned out to be worse than originally thought, and several other "mini-scandals" were revealed throughout the year. As a result, Wells Fargo was a big laggard in a strong financial sector, delivering just over half of the sector's 20% gain for 2017. This begs the question, is Wells Fargo a long-term bargain, or should investors stay away? Here's what Wells Fargo needs to do to get back on track, and what investors should expect from Wells Fargo in 2018. As I mentioned, Wells Fargo had a 2017 that was full of scandals and their fallout. First, the fake-accounts scandal that was revealed in late 2016 turned out to affect 1.5 million more people than originally thought. The bank was also caught up in several other smaller, but still very significant, scandals. Perhaps the biggest example was the July 2017 revelation that over 800,000 of the bank's auto-loan customers were charged for insurance they didn't need. The bank's management has been taking steps to rebuild the public's trust, but the scandals are having a real effect on the bank's bottom line. In the most recent (third-quarter) earnings report, Wells Fargo's revenue missed analysts' estimates, and fell during a quarter when its peers all grew revenue and beat expectations. Additionally, Wells Fargo's streak of being the most profitable and efficient of the big four U.S. banks has come to an end. JPMorgan Chase handily beat Wells Fargo on both ROE (return on equity) and ROA (return on assets) during the third quarter, and even Bank of America's ROA came in ahead of Wells', which would have seemed like a crazy prediction had you made it just a few years ago. We'll see if the bank's fourth-quarter results are any better, but I expect the damage-control phase to continue well into 2018, if not longer. The scandals have created a serious problem when it comes to the public's perception of Wells Fargo, which has made it more difficult to do things like convince new customers to open accounts, or take out loans from the bank. However, 2018 is looking like a solid year for the banking industry, and even if the bank takes longer than expected to recover from its scandals, Wells Fargo's profits should get a boost. For starters, interest rates are expected to continue to rise. The latest forecast calls for three more rate hikes in 2018, totaling 75 basis points (0.75%). Although it's not a perfect correlation, rising interest rates generally translate into better spreads (aka profit margins) for banks. Additionally, tax reform could give Wells Fargo a major boost. Just to put some numbers behind this, consider that Wells Fargo's effective income tax rate for the third quarter was 32.4%, and the bank has paid nearly $9 billion in income taxes over the past four quarters. While this number includes some state income taxes, it's fair to say that the newly passed 21% federal corporate tax rate could save the bank a large sum of money. This is likely the main reason why the bank's stock shot up in the weeks before tax reform passed. Is Wells Fargo's biggest advantage gone? In 2018, I expect Wells Fargo's profits to rise, but mainly because of positive industry conditions, and not because its own business will do particularly well. One question that remains to be answered is if Wells Fargo's unique competitive advantage -- its ability to cross-sell banking products to its existing customers -- died with the abuse and subsequent loss of its employee-incentive structure. If so, Wells Fargo may need to figure out another way to differentiate itself from the rest of the big U.S. banks if it wants to get back to the profitable and efficient bank that it's been for years.